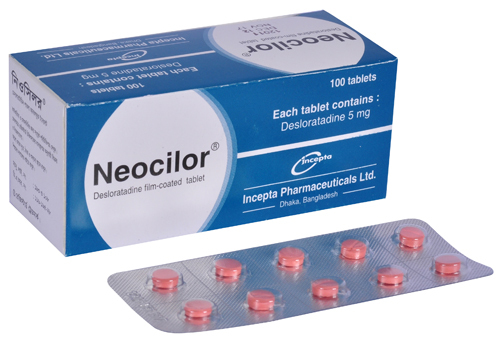 Neocilor tablet: Each film-coated tablet contains Desloratadine INN 5 mg.
Neocilor syrup: Each 5 ml syrup contains Desloratadine INN 2.5 mg.
Neocilor is a preparation of Desloratadine. Desloratadine is a long-acting tricyclic histamine antagonist with selective H1-receptor antagonist activity. It is a non-sedating antihistamine. Desloratadine has effects on the chronic inflammatory response to allergens and lacks effects on the QT interval of ECG, unlike some other non-sedating antihistamines. Allergic rhinitis: Neocilor is indicated for the relief of nasal and non-nasal symptoms of allergic rhinitis (seasonal and perennial). Chronic idiopathic urticaria: Neocilor is indicated for the symptomatic relief of pruritus, reduction in the number of hives and size of hives, in patients with chronic idiopathic urticaria. As there are no food effects on the bioavailability, Neocilor may be taken without regard to meal. Adults and adolescent of 12 years or over : 5 mg once daily. Child 6-11 years : 2.5 mg once daily. 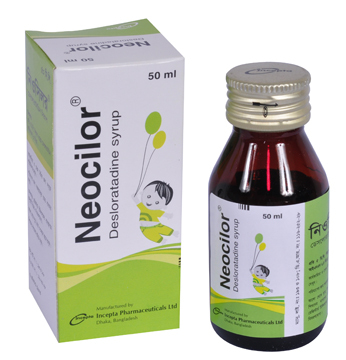 Child 12 months-5 years : 1.25 mg (2.5 ml Neocilor syrup) once daily. Child 6 months-11 months : 1 mg (2 ml Neocilor syrup) once daily. Patients with liver or renal impairment: A starting dose of one Neocilor tablet (Desloratadine 5 mg) every other day is recommended. Pediatric use: The safety and effectiveness of Desloratadine in pediatric patients under 6 months of age has not been established.